Tonight, I made hamburgers for dinner. It was one of those nights. I have been having them lately, and I think it must be because I am under the weather. I am just not into cooking this week. So, I was telling G that we were going to have hamburgers, and he gives me his tongue-hanging-out-of-his-mouth-like-a-dog pose that lets me know I have hit the jackpot with him. He is my picky eater, so when I hit the jackpot with something that is not chicken nuggets, it is a little victory. Then, he looks at me and with all seriousness says, “Mom, I think I want to have lettuce on my burger tonight.” I swear, I think I fell out of the chair. This boy does not touch the green stuff. Any green stuff. Ever. Seriously, if there is a fleck of oregano in his spaghetti, he’s all…mom, I don’t like the green stuff and I’m all…yeah, yeah, yeah, I get it. So, tonight I said, “ok buddy, sounds good”, as I was trying to maintain my composure. On the inside I was doing freaking back flips, though. I grilled the burgers, made stir-fried kale and bacon (again!–I think I am addicted, it is THAT good!) and some guac for the grownups and settled us all in at the table. He took a bite of his burger and was shocked to realize that lettuce doesn’t really have a flavor. It was pretty cute. At one point, he takes a bite and a big piece of lettuce comes out. He looks me in the eye and works it into his mouth and chews. Actually chews. On green stuff! It was nothing short of amazing at our house tonight. Baby steps and little victories. I will take them whenever I can get them. 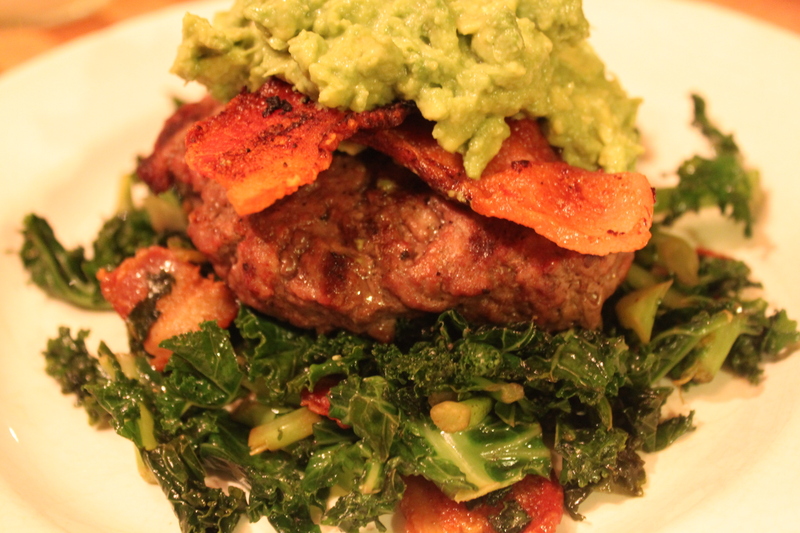 This entry was posted in Beef and tagged bacon, grass fed beef, guacamole, hamburger, Kale.